I have not read Repetition, so I can’t say much about Sebald’s commentary on Repetition, but Stephen Mitchelmore calls it a “remarkable essay, and he links to a post he wrote several years ago on three of Handke’s books, including this one. I also recommend taking a look at Lars Iyers lengthy essay on Repetition at Ready Steady Book. The novel meant much to Sebald, whose essay, somewhat uncharacteristically for him, contains unrestrained praise for what Handke achieved in this book. What I want to do now is not to discuss the particularities of this distancing from Peter Handke – nor do I want to be tempted by the considerable task of sketching the psychology and sociology of the parasitic species that takes literature as its host; instead, I simply want to experimentally process a few things regarding the book Repetition, which upon first reading in 1986 made a great and, as I have since learned, lasting impression on me. I don’t know if the forced relation between hard drudgery and airy magic, particularly significant for the literary art, has ever been more beautifully documented than in the pages of Repetition describing the roadmender and signpainter. Sebald wrote about Handke several times: first in an essay that appeared in Literatur und Kritik in 1975 and which is translated in Campo Santo as Strangeness, Integration, and Crisis: On Peter Handke’s Play Kaspar; and again in his 1985 anthology Die Beschreibung des Unglücks: Zur österreichischen Literatur von Stifter bis Handke, where he reprinted an essay on Handke originally published in 1983. He writes at some length about The Goalie’s Anxiety at the Penalty Kick in the latter essay, which is, unfortunately, not translated into English yet. I’ve done several posts about Handke over the years. Jo Catlings catalog of Sebald’s library, published in Saturn’s Moons, demonstrates how much Sebald admired Handke; the catalog lists nineteen books by Handke and one book about him. Only a few German-language authors had more books in Sebald’s library, notably Goethe and Thomas Bernhard. For yet another look at Handke’s book, head over to the great site Handke Online where there is an essay about Handke’s notebooks for Die Wiederholung, along with images of the notebooks. I love this post! I have written an essay on Sebald’s reading of Repetition i(‘”Die irdische Erfüllung”: Peter Handke’s Poetic Landscapes and W. G. Sebald’s Metaphysics of History in W. G. Sebald’s work’, in: W. G. Sebald and the Writing of History, eds Anne Fuchs, Jonathan Long (Würzburg: Königshausen & Neumann, 2007), pp. 179-197), and there’s a section on Sebald’s passion for Handke in my forthcoming book. 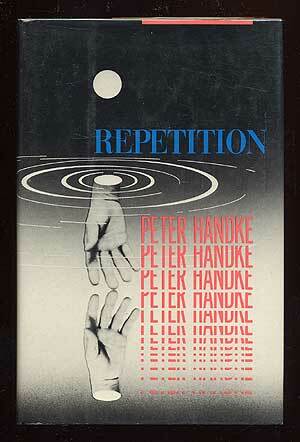 I’m so glad that Sebald brought me to Repetition – it is an amazing, beautiful, satisfying text. Thanks so much for your support for this project, Steve! I’m really touched and delighted that Sebald’s Bachelors has an enthusiastic reader beyond the walls of the academy. Let’s hope it doesn’t disappoint. I believe that in Catling’s catalog of Sebald’s library are more works by Kafka than by Bernhard and Goethe but I could be wrong. I will go back and count them!